The family members of the Indigenous People of Biafra (IPOB) and it’s leadership worldwide condemn in the strongest possible terms, the statement credited to Minister of Justice and Attorney General of the Federation (AGF) Alhaji Mallami over the refusal of this Buhari’ administration to obey multiple court orders to release both Sheikh El-Zakzaki and former National Security Adviser (NSA) Col. Sambo Dasuki from extrajudicial detention. The most recent ruling by Hon. Justice Ijeoma Ojukwu of the Federal High Court Abuja admitting Dasuki on bail has once again been ignored, so has numerous pronouncements by the courts to set Sheik El-Zakzaki free. This flagrant disobedience of the rule of law is not only shameful but also an impeachable offence. Coming at the heels of ‘Buhari’s’ lecture at the International Criminal Court (ICC) in the Hague on the virtues of rule of law and the commitment of his government to adhere to court orders, it is hypocritical and criminal for those that invited ‘Buhari’ to address them at the Hague conference to keep silent as rule of law is being destroyed in Nigeria. The black African President of the ICC Judge Chile Eboe-Osuji and the equally black African Chief Prosecutor of the court Madame Fatou Bensouda must cover their faces in shame for inviting a man they know doesn’t obey the law to address them on the need for a government to adhere to the rule of law. Should Africans be overlooked in the future for such sensitive appointments such as the ICC President or Chief Prosecutor, Africans should not complain of racism because such sensitive offices should be reserved for not only brilliant legal minds but also those who cannot be swayed by sentimental or material considerations. Inviting Buhari to address the ICC when he has steadfastly refused to obey the law when it comes to Col. Dasuki, Sheikh El-Zakzaky and many IPOB detainees is the greatest mistake the court has ever made. It doesn’t speak well of the diplomatic community in Nigeria either, especially Britain, the colonial master and creator, to maintain a deafening silence in the face of unbridled tyranny. If Britain can offer its public opinion on the probity or lack of, in the conduct of elections in Ekiti State, surely it has a moral obligation to admonish the ‘Buhari’ government on its refusal to obey the law. Refusal to obey any given court order is a reaffirmation that Nigeria is only practicing paper democracy, not indeed. Anywhere on earth, the government is above the law, that society seizes to be regarded as democratic. A US president obeys court orders, so does a British Prime Minister, why not ‘Buhari’. Therefore those presently referring to Nigeria as a democracy are knowingly and willfully misleading the public, because democracies obey the rule of law. When an Attorney General of a country proudly stand up to defend what is, in essence, indefensible, one is bound to question the collective mental ability of such a society and wonder if indeed they are civilised. Courage means standing up for what is right, especially in defence of those who cannot defend themselves regardless of ethnicity, religion or orientation. That is what IPOB was created for and what it will continue to uphold until Biafra is restored and beyond. 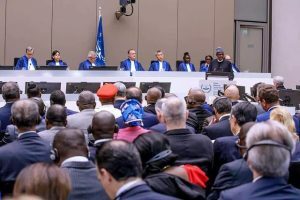 A race of people without conscience, as demonstrated by the two black principal officers of ICC that invited a dictator like Buhari to address them, could not possibly serve any useful purpose beyond servitude. If in the future black Africans are denied the opportunity to serve at such lofty levels, let no one cry racism. Judge Chile Eboe-Osuji and Madame Fatou Bensouda have brought shame and dishonour to a hallowed institution like the ICC by inviting a dictator they know doesn’t obey the law, to address them. The very least they can now do, along with the diplomatic community of civilised nations resident in Nigeria, is to prevail upon ‘Buhari’ to release Col. Dasuki and Sheikh El-Zakzaky without further delay as ordered by various law courts of the Federal Government of Nigeria. Nigeria Bar Association, National Judicial Council (NJC) and the entire judicial machinery in Nigeria should consider going on strike as a way of forcing this government to obey judicial pronouncements.